The opening line in So You Want to Be President? by Judith St. George is "There are good things about being President and bad things about being president." Judith St. George points out the good things like living in The White House and not having to worry about taking out the garbage. Some of the bad things about being President are having to dress up all the time and having lots of homework. Last Monday was President's Day and my children would say that a good thing about President's Day is that they didn't have to go to school. I was thinking that a bad thing about President's Day would be that everything would be closed including the library (later I found out it was open!). So, I planned ahead, stocked up on books by Judith St. George, and thought about what we could do as a family on the day off from school. 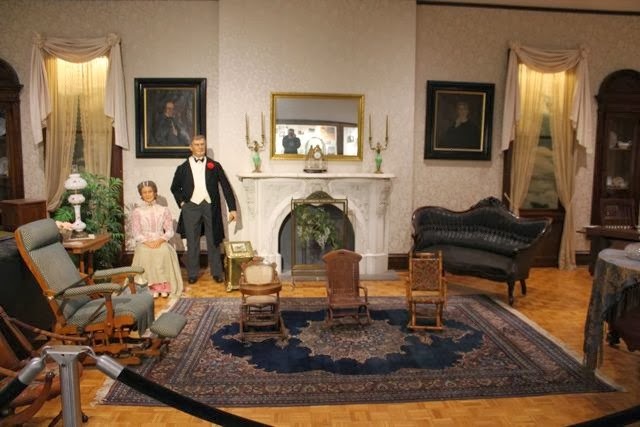 With Judith St. George's books in hand, my wife and I discovered that the William McKinley Presidential Library and Museum in Canton, Ohio would be open. 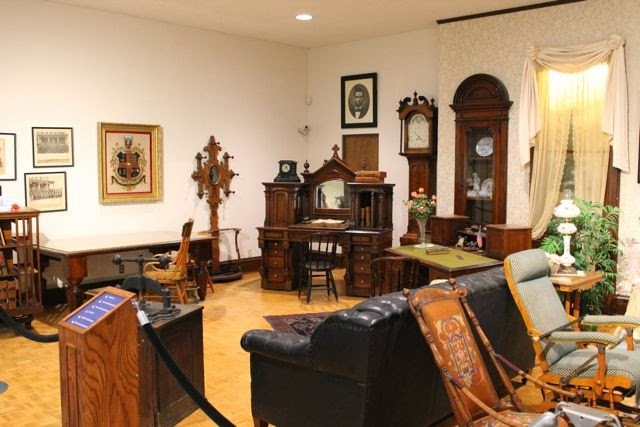 The museum would be hosting special guests too, which would make visiting the museum the perfect way to celebrate Judith St. George's birthday. Judith St. George is the author of over 40 books for children including So You Want to Be President?, illustrated by David Small, which was awarded the 2001 Caldecott Medal. On her website she states, "Because children's book authors tend to write the kind of books they once loved, when I started to write children's books, I wrote historical fiction." Over her career she has written historical fiction, picture books, mysteries, nonfiction, and biographies about American history. According to numerous websites, St. George's passion for American history was fueled when she lived for a short time in the Longfellow House, (Cambridge, Massachusetts) which was George Washington's headquarters during the American Revolution. Her passion for American history led her to write many award winning books including The Brooklyn Bridge: They Said It Couldn't Be Built (American Book Award Honor Book, 1982), The Mount Rushmore Story (Christopher Award, 1986), and Panama Canal: Gateway to the World (Golden Kite Non-Fiction Award, 1989). For St. George, in addition to her passion for American history, she is motivated by her readers, "I want my readers to care as much about the outcome of historical events as if they were reading today's headlines. I want my readers to be aware that history is an ever-rolling stream and that the past can't be separated from the present. Above all, I want the people in my books to come alive for my readers the way they come alive for me." (Teacher Vision). 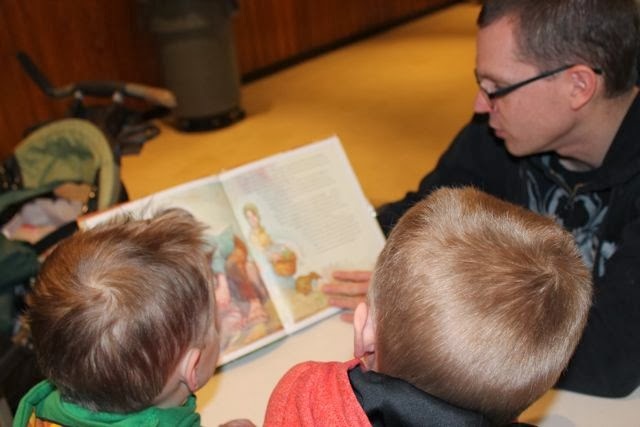 My family usually reads as many books as we can by the author or illustrator we are celebrating and then we decide on an activity to bring one the books to life. However, this week we did things a little different. 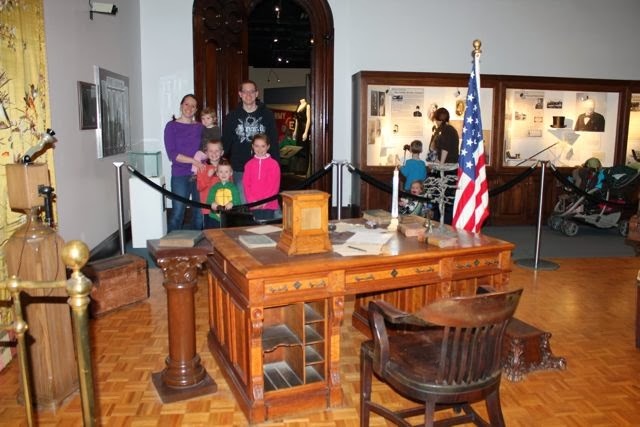 We began our birthday celebration with our activity by attending the William McKinley Presidential Library, Museum, and Memorial, Canton, Ohio on President's Day. We took along our books So You Want to Be President? and Stand Tall , Abe Lincoln. I couldn't wait to take the family to The McKinley Gallery. It had been over ten years since my last visit. The last time I was at the museum was when I was a teacher on a class field trip (Before having my own children! Wow, that feels like a long time ago!). 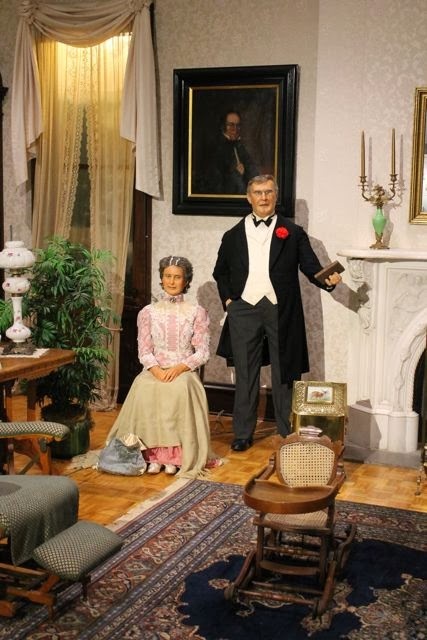 William and Ida McKinley greeted us when we entered the gallery. My children were surprised (and a little creeped out!) that the figures of the President and The First Lady moved and talked! Our knowledgeable docent had a story for every item in the gallery. 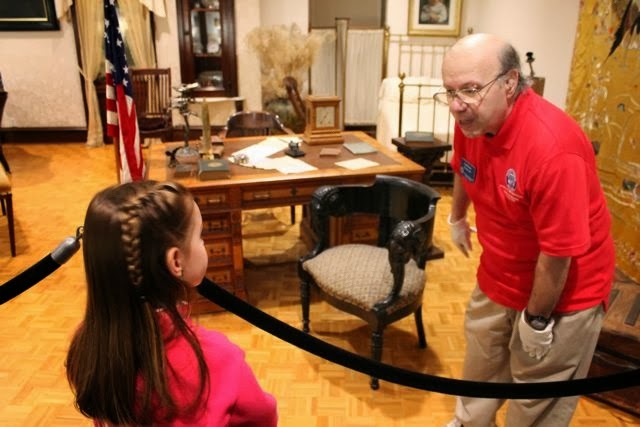 He enjoyed telling us about this double-sided desk that McKinley used in The White House. 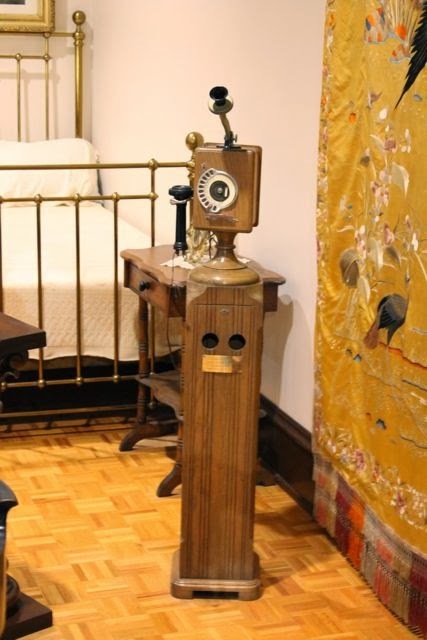 This telephone was used during McKinley's campaign and did not have a ringer, but two flashing lights on the front to alert there was an incoming call. 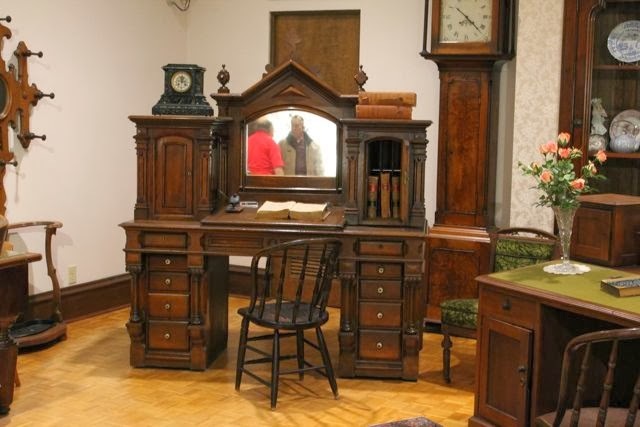 This was McKinley's Congressional desk that he used at his home in Canton, Ohio. 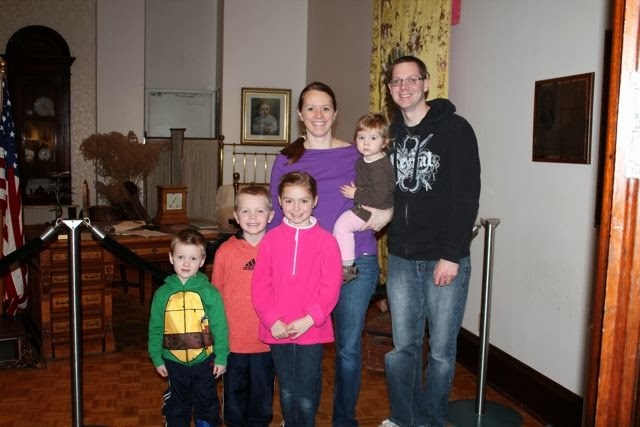 A big thank you to our docent for taking these two family photographs! We learned about the tragedy of McKinley's death. He was shot with a revolver similar to this one in September 1901. After poor medical care, McKinley died eight days later of an infection from his gunshot wound. 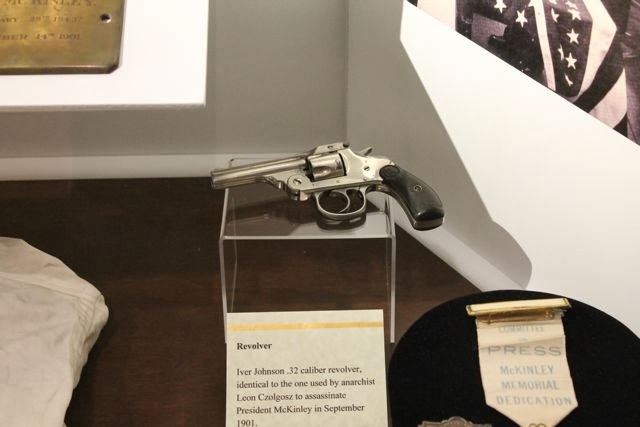 McKinley was shot twice but only one bullet was removed. 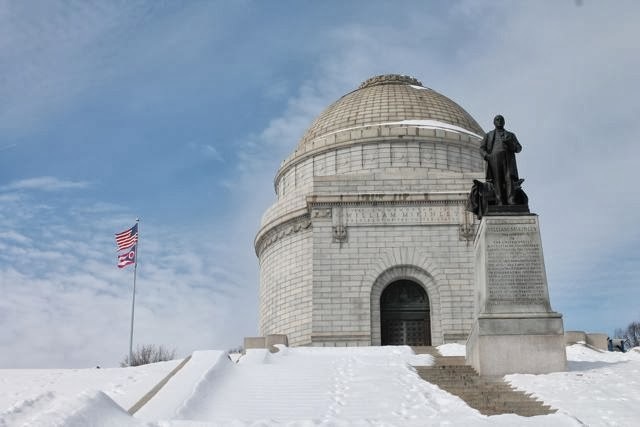 William McKinley is the second President mentioned in So You Want to Be a President?. 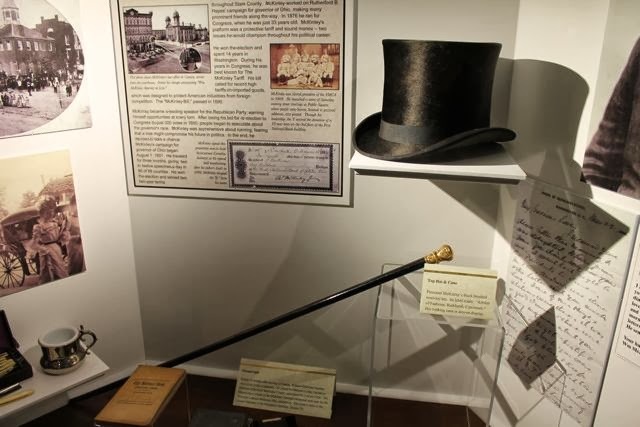 This picture is of McKinley's wool top hat and cane that he wore when he "dressed up". McKinley was also known for wearing a lucky red carnation on his lapel, which David Small included in an illustration in the book. 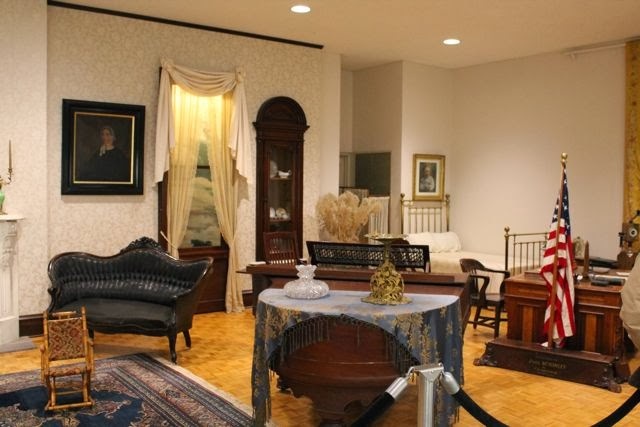 According to our docent, McKinley gave his lucky red carnation to a little girl moments before he was shot. My children and I really enjoyed Judith St. George's Turning Point biography series. 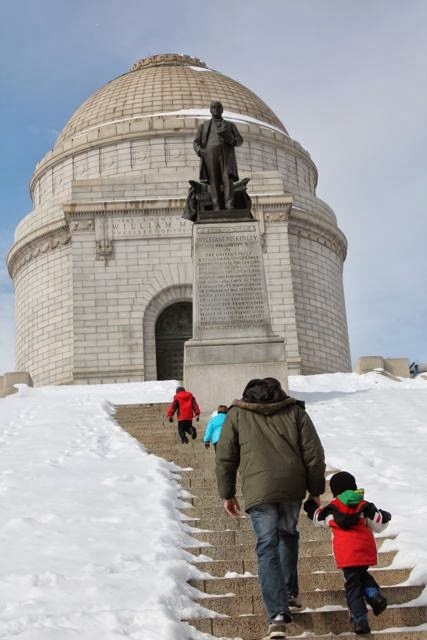 We read Stand Tall, Abe Lincoln and You're On Your Way, Teddy Roosevelt (who was McKinley's Vice-President and later became President after his death). These books take a close look at how events from their childhood developed personal qualities that would later be vital characteristics they would need to be successful leaders. 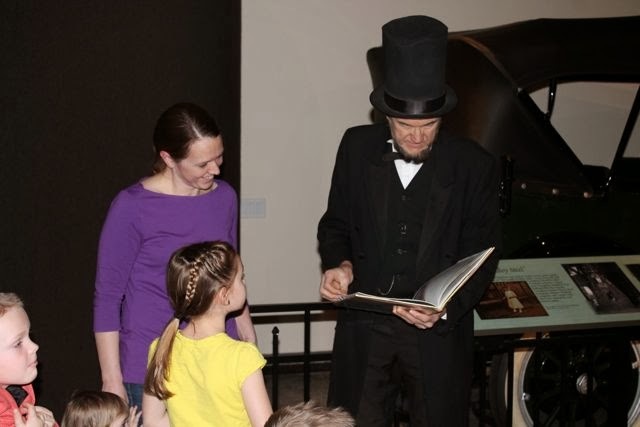 We learned that Sally Johnston did many things to "turn" Abe's life around after the death of his mother including fostering his love of books. We learned that Teddy Roosevelt had many health problems as a young boy including asthma. Teddy worked hard with support from his father to strengthen his body and mind to overcome his illnesses. Also in the series are Take the Lead, George Washington and Make Your Mark, Franklin Roosevelt. 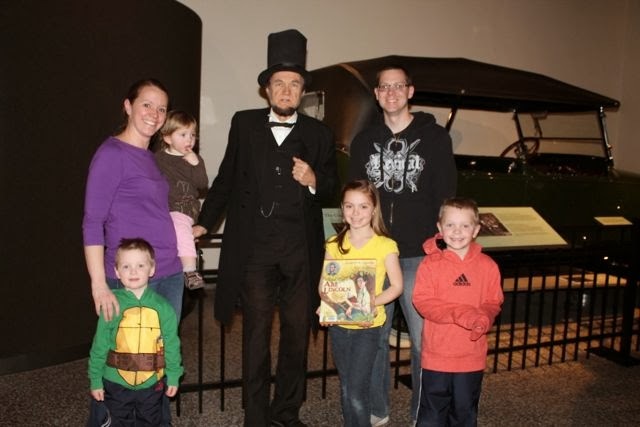 At the McKinley Museum we were lucky to meet Abe Lincoln. We told him about Stand Tall, Abe Lincoln and that we were going to read it together as a family. He wanted to make sure it was a good book before we did. He verified the childhood stories and assured us that Judith St. George wrote a very accurate book! Thanks to our docent friend for another family photo. My youngest son is now very confused about Lincoln. In a recent visit to Washington D.C. we visited Ford's Theater and learned about Lincoln's death. Now he insists that Lincoln is still alive! After meeting Abe Lincoln we ate lunch and the boys wanted to read a little bit of Stand Tall, Abe Lincoln. We finished the rest that night before bed. The Memorial building was closed on this day. However, we still climbed the 108 steps to the top! 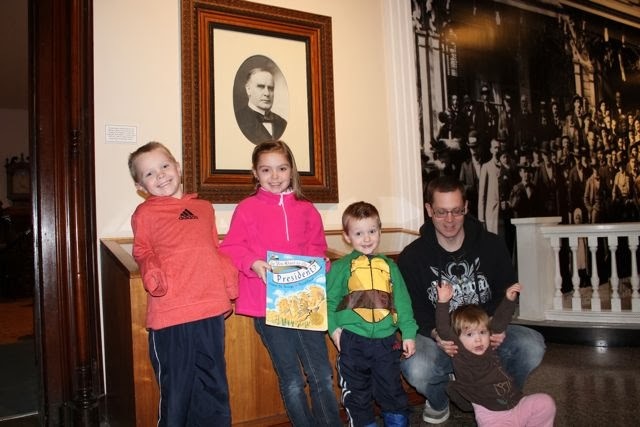 This year, we learned that there are so many good things about President's Day; a fun visit to a museum, interesting books to read about presidents, and time together as a family away from school. The only bad thing we could think of was that President's Day only comes once a year. 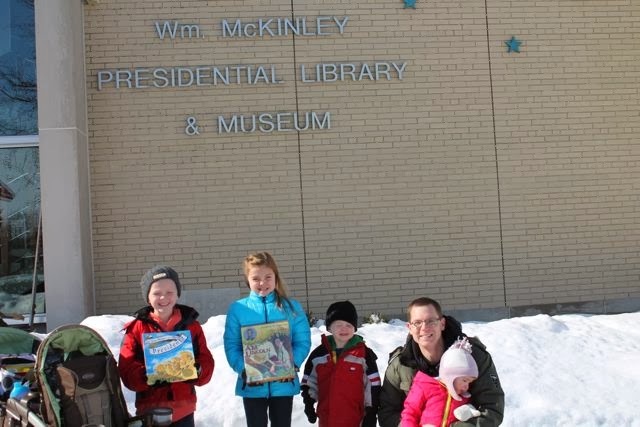 We had such a great time and learned so much that I have a feeling we will be revisiting the McKinley Museum and books by Judith St. George long before President's Day comes back around next year.